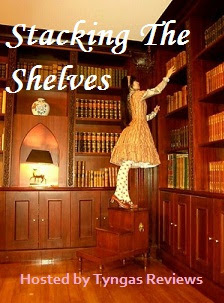 Due to recent events or I guess not so recent at this point I have decided to switch from In My Mailbox to Stacking the Shelves posts. Because they are pretty much the same though I will be starting my Stacking The Shelves post at 15 where I left off on my IMM posts. Also I'm pretty proud of myself I made that button all by myself! I got my first paycheck for my summer job last week so this week I went kind of crazy with my Nook and at Half Price Books! Thanks Ezmirelda @ Parafantasy for allowing me to be a part of this ARC Tour! Hemlock is really good! I think you'll like it! 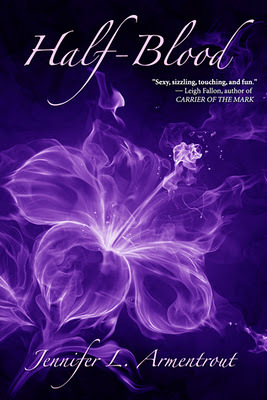 I still haven't read any of Jennifer Armentrout's books :\ I should probably get on that! Great haul! I loved Hemlock and Half-Blood. I want to read White Cat. Half Blood and Easy look so great and I hope you enjoy! Hemlock was also really good! I have just finished reading Easy and I enjoyed it. Lucas is a dream worthy guy. If only there were guys like him in real life *sigh*. I want to read Hemlock; it looks really good. Happy reading! 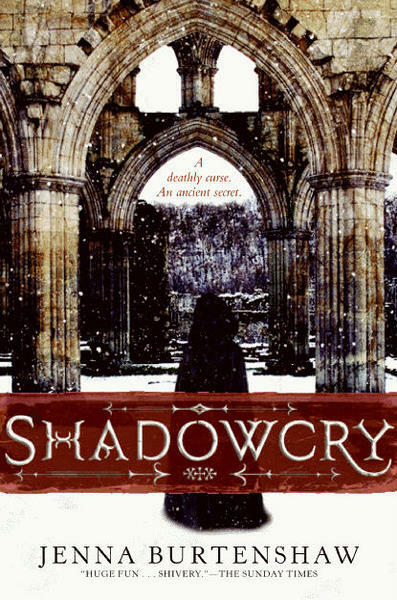 I haven't read these, except for Shadowcry, which I loved. 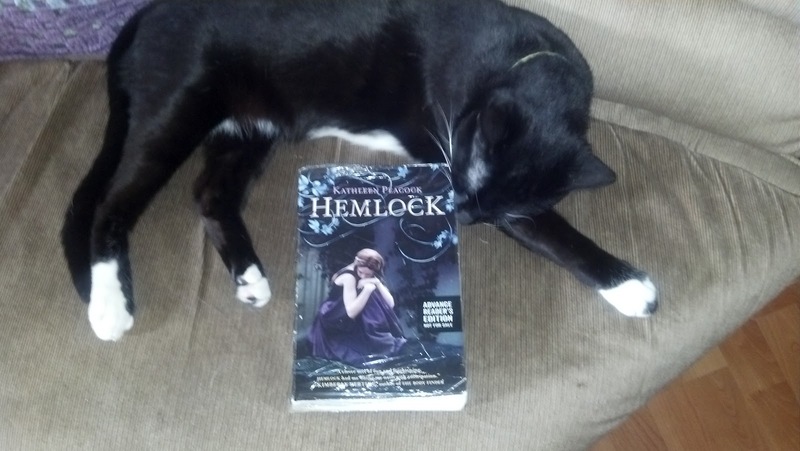 I want to read Possess and Hemlock too. Happy reading! Nice haul, been wanting to read Shadowcry, White Cat and Half Blood. Hemlock is so freaking awesome! I also saw Swoon for pretty cheap the other day, though I didn't pick it up.. now I regret it. Enjoy your goodies! An amazing haul! I have read and loved a few you received. Sweet books! I've heard Possess is great, and White Cat is very, very good. You have such beautiful covers in your haul!!! *sigh* Some of these titles are new to me, but look like they're well worth investigating more. Your meme button is too cute. Hope you enjoy. Happy Reading. Thanks so much for visitig my STS ! You got some really good YA Titles in there. Hope you enjoy your new books. Great haul, Emily! I have Possess on my TBR list and I can't wait to get to it. I haven't heard of the others books but they look interesting. And I might add Swoon by Nina Malkin just for the name considering the name of my blog, hehe. I loved White Cat! Happy Reading! 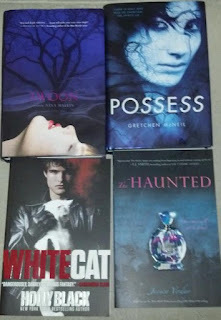 I am obsessed with the Curseworkers series -- I just bought Black Heart. I actually listened to the first two books on audio but also bought them too. I definitely need to pay a visit to Half Price Books soon! I haven't been there in a few weeks. I've heard such fantastic things about both White Cat and Possess- I definitely need to read those soon! Great books there, Enjoy them all and Happy Reading :D! Nice haul, hun! I've heard good things about Easy and White Cat, too! Also, your cat is gorgeous, love that photo! Omh I loved Hemlock! one of y top reads this year! And White Cat is really good too!